It is no coincidence that this week’s recipe is quick, easy, with ingredients to give you an energy boost! My weekly post is later than usual this week due to work pressures however worth the wait I hope! 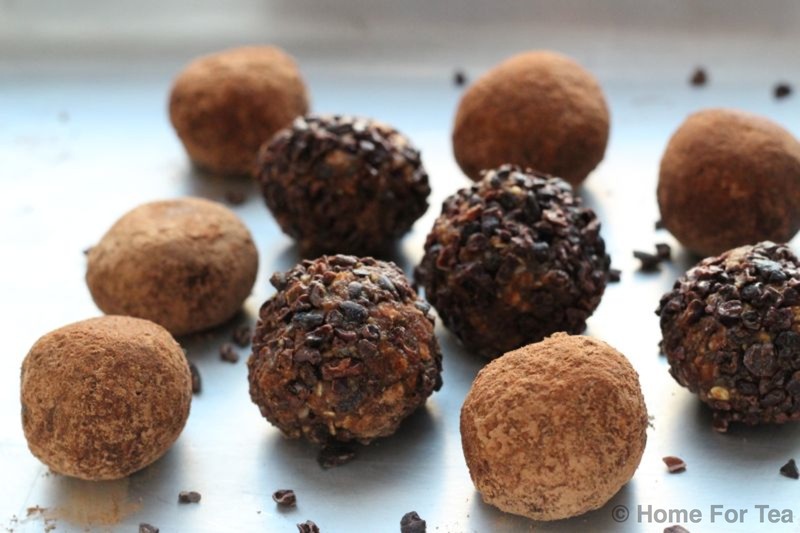 These energy balls are delicious, made in minutes and quite addictive. They are full of good things and contain only natural sugars. I have been trying to cut down on sugar over the past year and I get my ‘sweet fix’ now from dark chocolate (74% cocoa solids), these energy balls and these sugar-free chocolate chip cookies from a previous post. (I am sure any goodness is negated however once you eat more than 4 of them in one go!). I love one of these with my morning cup of coffee or as an afternoon snack, they would be perfect for lunch boxes as an alternative to bars or crisps. In terms of the toppings there are two alternatives in the recipe – raw cacao nibs or cocoa powder. My own preference is for the cacao nibs as I find the cocoa powder ones a bit messy to eat – in future I think I will use finely chopped nuts instead of the cocoa powder. The recipe is one of Donal Skehan’s – I have changed it just slightly. (The photos are my own but I was trying to copy his though!). Add all the dry ingredients into a bowl and mix until well incorporated. Add in the wet ingredients and combine by hand or pulse in a blender until a sticky dough has formed. Dampen your hands and roll about a tablespoon of the mixture between your palms to form a bite-size ball. Pour the cacao nibs or cocoa powder, whichever you prefer onto a plate and coat each of the balls in the topping of your choice. Chill in the fridge for about an hour before eating, if you can wait that long! Store in the fridge or freezer, ready for a healthy treat whenever you fancy!